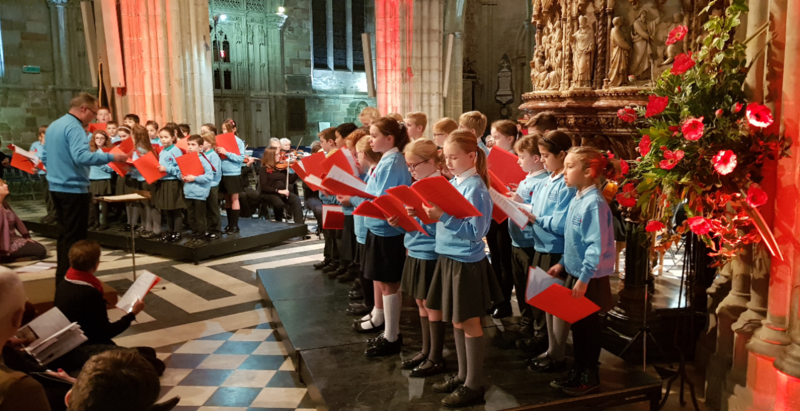 Fifty schoolchildren from Worcestershire raised the roof at a sell-out charity fundraising concert at Worcester Cathedral on Saturday, November 10 to commemorate the centenary of the World War One Armistice. Voices of Remembrance was the culmination of a special partnership project between Worcestershire Symphony Orchestra, Worcester Cathedral and the Rivers C of E Academy Trust schools and was sponsored by Worcestershire Ambassadors. In the first half of the concert Hymn to the Fallen by John Williams from the film Saving Private Ryan and A Shropshire Lad by George Butterworth were followed by Remember Them, which comprised poems written by children and set to music by composer Laura Rossi, who attended the event. Ms Rossi’s Voices of Remembrance, an orchestral and choral work featuring readings of World War One poetry, filled the second half. BBC Hereford and Worcester presenter Tammy Gooding narrated the poems, which included works by Wilfred Owen and Rupert Brooke. The event was featured in print and online by the Worcester News and Worcester Observer.